Over the last few weeks I’ve been spending most of my free time in the Bocuse d’Or kitchen, experimenting with different cooking techniques for the Irish beef. It’s fantastic to have the facilities to take myself away and focus purely on the competition and I can’t thank UCB and all the companies which donated equipment enough for making the kitchen happen. This week, I’ll be working in a very different kind of kitchen, that of Régis Marcon, joint owner and founder of the three Michelin starred, Auberge et Clos des Cimes. Régis won the Bocuse d’Or in 1995 and is still involved in the competition. I have a huge amount of respect for Régis’ cooking and I’m really looking forward to working with his team. Whilst I’m there I’m hoping to drop into Lyon and familiarise myself with the surroundings to help focus my mind and prepare myself for my greatest challenge yet. Whilst it might be my greatest challenge, I certainly don’t feel like I’m going it alone as I have a great team behind me. Andreas is allowing me three months off in order to prepare for the finals, the team at Simpsons are also a great support as are the staff and students at the college. Kristian is going from strength to strength and is proving his competition through his performance in the Chef of the Year and Graduate Chef of the Year awards and it’s great to have the experience of Nick, Brian and John in the team. Our next challenge is to raise the necessary funds to help us to make an impact in Lyon and to build a platform to help future competitors to succeed. We’ll be holding a fundraising event at the UCB on November 23, please put the date in your diary if you’d like to show your support. Hi from an Englishman who has lived in Lyon for 15 years. 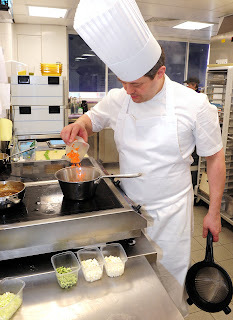 I was taken on a tour of the Bocuse Institute a couple of years ago by its press officer and it was very impressive. We saw the kitchens, le bakery, everything in fact then she invited me for lunch in the experimental restaurant. Oh, and I got to meet one of the chefs in a professional context outside of Bocuse. Can't remember his name but he was tall, slim, and wore glasses. May I wish you all the best with your project. Are you on target to achieve what you wish to?